Happy New Year – 2015, Bring it on! Home » Fyne Futures » Happy New Year – 2015, Bring it on! And happy Monday to you all too! 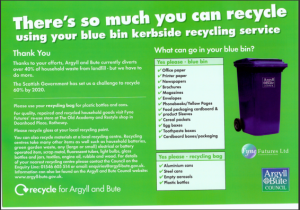 Normal recycling services are resumed. The on island crew will be catching up on sorting of collected materials and ReStyle viewings, collections and deliveries. If you have having a New Year makeover, why not consider donating your pre-loved furniture to us. The on island crew will be focussed sorting of collected materials and ReStyle viewings, collections and deliveries. Friday – we will be collecting from local business and community organisations. Blue bin and green recycling bags are free, and so is advice on how to.